What Foods Will Help Lose Belly & Abdominal Fat Quickly? Including certain foods as part of your diet may help you reach your weight loss goals sooner. When consuming these foods, be sure to control portions and consider their impact on overall daily calorie intake. These foods are only part of a whole strategy that involves a reduced calorie diet and increased activity levels. Low-calorie diets containing at least 3 servings per day of dairy helped participants in a study published in "Obesity Research" in July 2005 lose more weight than participants who followed a low-dairy diet. People on the high-dairy diet also maintained more lean mass during their diets than those on low-dairy diets. Stick with low-fat dairy products, as these foods can otherwise be high in fat and calories. 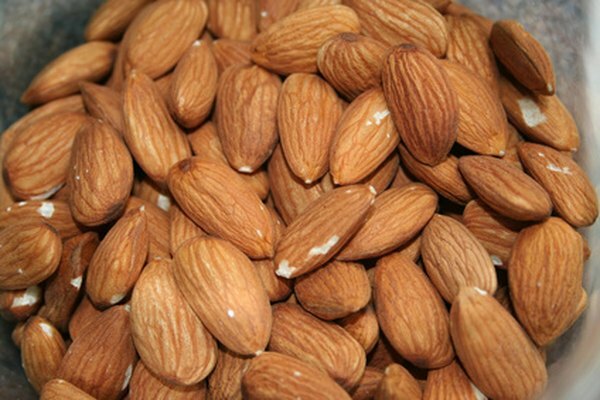 Purdue University researchers found that the body fails to absorb a portion of the calories in almonds and that up to 3 ounces of almonds per day does not contribute to weight gain. The results, published in the “British Journal of Nutrition” in September 2007, suggest that almonds, which contain multiple phytonutrients, fiber and heart healthy monounsaturated fat, suppress appetite. Replacing refined grains with whole grains may help prevent fat from accumulating around your belly, reports a Pennsylvania State University study in the "American Journal of Clinical Nutrition" in 2008. Eat brown rice instead of white, choose whole wheat pasta and go for oatmeal at breakfast instead of a bagel. A diet higher in protein may help you feel full longer and deter snacking and overeating. An editorial review, published in the "American Journal of Clinical Nutrition" in 2005 notes that increasing the percentage of your daily calories that comes from protein may help you lose weight. Stick to lean sources like skinless poultry, egg whites and lean cuts of beef to avoid consuming too much saturated fat. Antioxidants in green tea may help you lose weight. Authors from the Department of Human Nutrition and Health, Basel, Switzerland discussed green tea’s effects on weight loss in a 2006 edition of the journal, "Molecular Nutrition and Food Research." They point out that several studies support that green tea effectively reduces body weight and body fat and increases fat oxidation and thermogenesis, which is the calorie-burning ability of your body. Researchers Julie E. Flood and Barbara J. Rolls conducted a study published in “Appetite” in 2007 showing that eating a serving of soup prior to a meal significantly reduces the amount eaten at that meal. Go for broth-based soups with generous amounts of vegetables to minimize calories and fat. Snacking on peanuts may help with weight loss. Purdue University researchers theorize that peanuts increase feelings of satiation and may raise the metabolism slightly. Over eight weeks, participants in this 2003 study gained no weight even when adding 500 calories of peanuts per day to their diet. Fatty fish like salmon and mackerel contain Omega-3 fatty acids which may help you shed pounds. The “Journal of Nutrition” reported a Japanese study in December 2007 showing that the consumption of fatty fish may change the way the body metabolizes fat, increasing the amount of fat burned. Hot peppers contain a compound called capsaicin which may help decrease appetite and speed up your metabolism. A Japanese study published in the "British Journal of Nutrition" in August 1999 showed that the consumption of red pepper reduced protein, fat and overall energy intake. High in fiber, antioxidants and vitamins, non-starchy vegetables satisfy your need to munch. Dark leafy greens, broccoli, asparagus, bell peppers and green beans offer very few calories per serving, meaning you can fill your plate without causing weight gain. American Journal of Clinical Nutrition: The Satiating Power of Protein—a Key to Obesity Prevention? Does Tea Help With Stomach Fat?